I read a great article on Multilingual living and decided to put together a TOP 5 REAONS why your children are not speaking in Tongan. 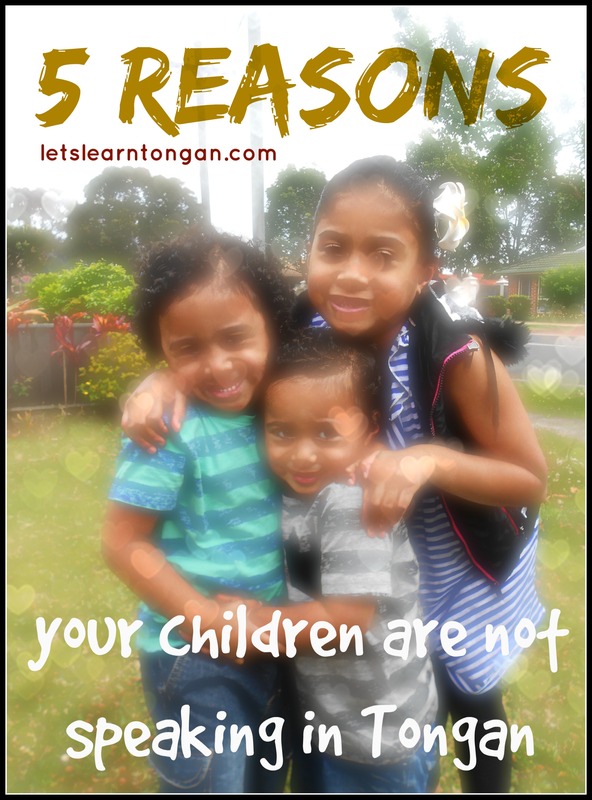 In my own experience with my children these are the 5 top reasons why they were not speaking in Tongan. So you want your children to speak in Tongan but you are finding it very challenging. Consider these 5 reasons as to why or what is holding your child back. Same reasons here apply to anyone learning the Tongan language not just children. Do your children feel comfortable to speak the language? Are they continually getting told off to speak in Tongan by you the parent or grandparents? Do they get ridiculed for their speaking or lack of speaking abilities at school, by friends, at church. You need to encourage them and make them feel comfortable and it starts at home. As an example, I tried to give them positive experiences by reading the English bedtime stories in Tongan. I would also make my kids laugh with silly songs I made up for them. Do they have access to a wide range of learning materials in the Tongan language. This will continue to be a problem as there are no (in my opinion) interesting books or learning material in the Tongan language for children. Keep an eye out for the ebook (The Hungry little mouse) coming out soon on youtube. Are your children being exposed enough to the Tongan language. There may not be enough reading resources for children but they can listen to the language. There are plenty of digital radio programmes, Tongan songs and Tongan news all on youtube. While youʼre doing chores at home, play it in the background. Is speaking in Tongan enjoyable for your children. Do they find it interesting or difficult and boring? Play games using the Tongan language will help make it enjoyable. Play cards, find items around the house, sing songs. Is there a need for them to speak in Tongan. Do they have grandparents or parents that can speak to Tongan to them? Are they part of a Tongan speaking Congregation? Are they in a language class that they need to speak in Tongan? Will they be visiting Tonga anytime soon? If they see no apparent need to learn they will find it more difficult. Did you find this useful? let me know. A great tip to learning Tongan is comparing bible passages in English & Tongan. Kids learn Tongan by reciting bible verses and hymns durnig Faka-Mē or White Sunday in May which is a great way to pick up vocabulary. Here is a visual of a well known bible passage Matthew 7:7-8. Simply compare the verse and recite by heart and you will add to your vocabulary. 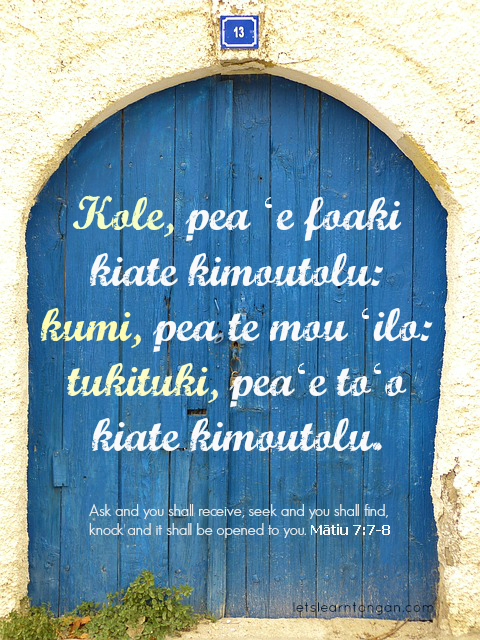 For more Tongan bible passages share and let me know you like them. Ko e hā ʻa e ʻuma faka-Tonga pea ʻoku ai fēfē? Ko e ʻuma faka-Tonga ʻoku tatau mo e ʻuma fakananamuʼ, ʻoku faingofua pe ʻene ai ka ko e ngaahi meʻa eni ke manatuʻi. What is a Tongan kiss and how is it done? It is also known as the sniff kiss, it is quite easy to do but you must remember several things. Most of us are quite familiar with the Tongan kiss by the way our parents, grandparents and elderly greeted us. We Tongans use it as a sign of affection. While I may have once thought it an awkward greeting in my teenage years I now embrace it fully and greet my children no other way. Its origins must be ancient going back to our South-East Asian roots, as they also greet this way. It is also similar to the Māori greeting known as Hongi. While they greet using nose to nose, we Tongans use cheek-to-cheek. The significance of the sniff to the Māori people is that it symbolises the breath of life, breathing in the mana of the person you are greeting. Knowing all this, gives you a whole new perspective on the ʻuma faka-Tonga. My children use to run away every time their grandma said it was milimili kilimi time. Since Iʼve explained to them the following tips they quite like receiving kisses in the Tongan manner. milimili kilimi is for smelling nice when you greet people. mihi is how we really show affection for the people we love. 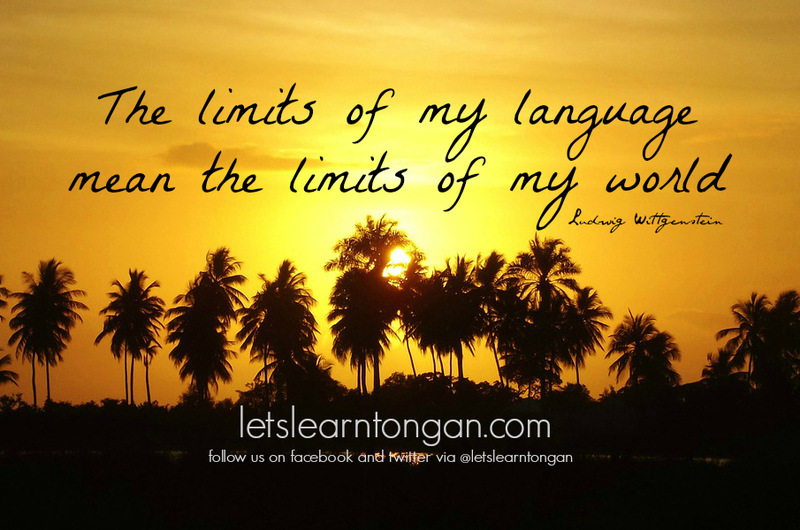 The goal for my blog in 2014 is to make learning the Tongan language easy, fun and shareable for you all in this digital age. Like climbing a coconut tree the view is better from the top but we can only share as much as we know. The limits of my language (ie my understanding of the Tongan language and culture) is the truly the limits of our own world. For parents who are fluent in Tongan please do not limit the view of your children. For those trying to improve, join in the conversation via our socail media page and let us broaden our horizon’s together. The school year has ended with our presentation day last saturday. It was a heartwarming day here in Sydney with the words of our guest speaker still resonating with me. 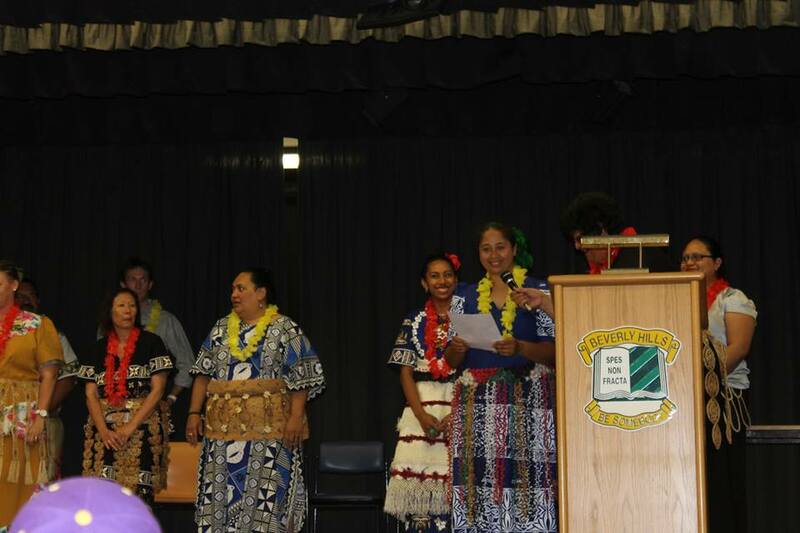 The guest speaker Albert Vella who is the President of the NSW Federation of Community Language Schools, talked about the need and importance of speaking Tongan at home. What is the point of going to Tongan School and learning but not speaking it at home. So that is my new years resolution to be mindful of how much English I actually use and to increase the use of my Tongan at home. Ko e ha ‘aonga ako lea faka-Tonga kae foki ki api ‘o lea faka-palangi! What is the use of learning Tongan but returning home to speak in English! Lea faka-Tonga! Speak in Tongan! There is a rule in my house. Lea faka-Tonga! For the most part my kids and I do speak in Tongan. But like most kids nowadays if they are not encouraged to speak the language they will not. My 7yo daughter was speaking Tongan regularly before primary (elementary) school but now has to be prompted. Hence Uncle Sam’s message. A friendly reminder to my kids and myself. ‘Oku ou fiema’u ko e ke ke lea faka-Tonga! 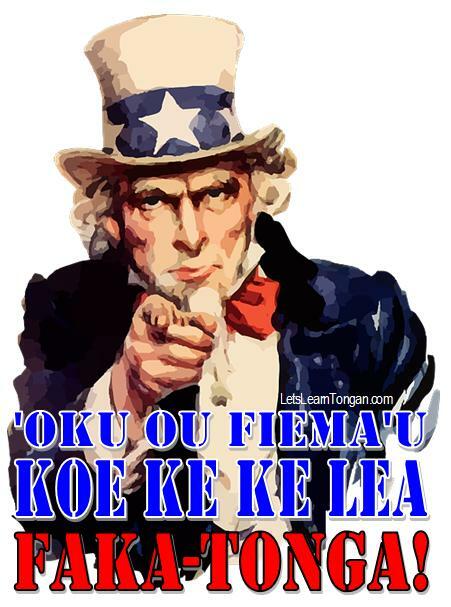 I want YOU to speak in Tongan! Print it out, laminate it, use it and share it.